The following steps are provided to help get you started projecting your BlackBerry screen contents with your ShowMate. For complete instructions on how to use your ShowMate, please refer to the ShowMate User's Manual. You may also download a PDF version of these Getting Started instructions for future reference. 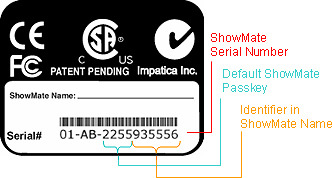 The Impatica Connector application must be installed on your BlackBerry before you may project the BlackBerry screen through the ShowMate. Set the Screen Capturing (or Recording on 4.6+ devices) permission to Allow. By default it is set to Deny. If you are associated with a BES (or have ever been associated with a BES), you may not be able to change this, in which case an application control policy would have to be set on the BES and the Impatica Screen Projector/Impatica Connector would have to be pushed to the device with this setting set to Allow. Unzip the Updater package to an appropriate folder on your computer. Follow the driver installation instructions above again. The updating process will begin. First the new firmware will be transferred to the ShowMate. You will see progress bars during this time. Next, the new firmware will be committed to the ShowMate. During this time, the software will warn you not to disconnect your ShowMate. The updater software will indicate that the update is complete. At this time, you may disconnect your ShowMate and close the Updater application. Wait for the ShowMate splash screen to appear. To stop projecting simply select the application again and select "OK" when asked "Stop Screen Projection".